Groucho must be lacking confidence.We turned up at the venue and it looked like there weren’t too many hashers there.However, Groucho said he thought there would have been even less so there may not be enough sweeties to go round (there were).Poor Groucho was having a bad day but it gets worse.However, he was ably assisted by um um was it Blob or Taillamp – note to self – do the blog same day. Anyway, onon to the trail. But wait, Groucho is explaining – “There’s a check just there look, but ignore that one.Onon up there look, there’s another check, you can ignore that one too, just turn right” (Groucho indicates by pointing to the left).Ok, so it looks like we are on our own then. to lay the trail I should correctly say. Rumour has it he gave this maid lots of tips plus of course a few dirty tricks. She in turn was very impressed so I've been told by the wonderful trail that began to unfold. This maid was given all the signs by her tutor signs on the trail that is, long/short splits threw her a bit But Tampa our hare made every thing fit. Fit into place these the blobs of flour did do even though our maiden didn't always have a clue. The route over which this maiden did go was tiring she did say I seem to have been on Woodbury most of the day. With cunning plans Tampa did reveal, reveal that a successful hash its more of a sprint, or was it a dash. Well done to tutor Tampa, standing tall, whilst our fair maiden Freeze-Frame survived to tell us all. 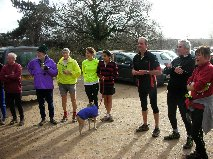 Spocky took part in The Four Trigs on Sunday 5th February and completed the 17 mile cross country route in 3hrs 17mins, also a PB for him, well done. On Saturday 4th February, Radiohead took part in the Moonlight Challenge (yes, at night....wierdo!) which was 32.75 miles on various terrain which he completed in 5hrs 7mins and came in 2nd place! Well done. It was one of those horrid mornings when all looked so grey; so cold; so uninviting to leave the warm sanctum of home, specifically bed, to go hashing. However, the warming thought of Woodpecker’s first trail of 2012, and that he was our newly awarded Hare of the Year 2011 would make the effort all so worthwhile. That’s what PP said anyway. I was still asleep! First thoughts were correct though as it was so grey; so cold and so uninviting. The biting wind and chill up on Haldon Hill were extremely evident on leaving the car. 20 or so hardened Hashers of the ‘Woodpecker Appreciation Society’ braved the elements. Tampa, Brains and Coffin arrived late, which led to a family domestic later on as to whose fault it was when as acting Sheriff I issued fines their way. Good luck to all those doing the Four Trigs on Sunday,a self navigated race around Trig points around the Sid Valley involving 16.2miles of running/walking and 2999 ft of ascent also anybody running the Fulfords 5 in Exmouth and finally Radiohead who is doing the moonlight challenge in Kent.